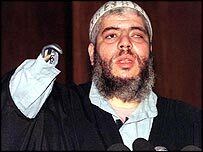 UK police have been given more time to question Muslim cleric Abu Hamza al-Masri, who is being held on suspicion of committing terrorist offences. He was arrested on Thursday at Belmarsh Prison, south-east London, where he is already fighting extradition to the US. He is being held by police on suspicion of commissioning, preparing or instigating terrorist acts in the UK. Magistrates at Bow Street, London, granted police a warrant to hold Mr Abu Hamza until 2 September. Police have taken him to Paddington Green station in central London to question him. Under the Terrorism Act 2000, police can hold the cleric for a maximum of 14 days before deciding whether to charge or release him. A Met Police statement said: "A 47-year-old man was arrested Thursday morning under Section 41 of the Terrorism Act 2000 on suspicion of being involved in the commission, preparation or instigation of acts of terrorism. "He has been taken into custody to a central London police station where officers from the MPS Anti-terrorist Branch will interview him. He was arrested in the London area." The Crown Prosecution Service say they are working with the police to see if charges will be brought. If they are, the charges will be given priority over the US extradition attempt. The 11 charges the US authorities want Mr Abu Hamza to face include giving advice to those involved in a Yemen kidnapping in which three Britons died in 1989. British police say his arrest is not related to the accusations in the US and is "part of separate, domestic inquiries". "He'd become one of the best known faces of radical Islam and the jihad movement"